There's a demo available now. There are lots of nice touches in the trailer for falconry-based platformer Eagle Island, not least the fact that your ranged attack involves flinging your pet owl at enemies. I appreciate a game that goes all-in on a theme, and in that respect this might be the most avian platformer ever, featuring as it does a plot that sees you rescuing a kidnapped owl from an enormous eagle god. 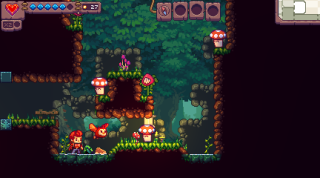 There's some lovely pixel art, and procedural generation for some reason; there's also a demo of the alpha version that you can download here. Eagle Island has an ongoing Kickstarter, one that's raised less than half of its target, with only two weeks left to go. Mixing Metroidvania elements with nine procedurally generated, seemingly Zelda-dungeon-style stages, if all goes well Eagle Island will release sometime in July 2018.